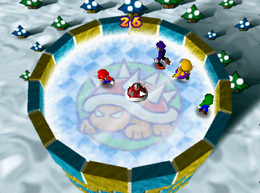 Ice Rink Risk is a 4-player minigame found in Mario Party 3. It is also included in the minigame compilation title, Mario Party: The Top 100. Official artwork of Luigi from the minigame. The players have to avoid being hit by Spiny Shells while running away on the slippery ice that the players are on. Players may also stomp on other players to stun them, making them more likely to be hit by the Spiny Shell. As time passes by, more Spiny Shells appear up to three. All players standing after 30 seconds win. 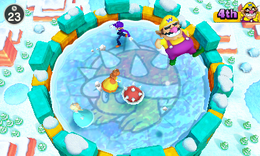 Game Rules – "Try to avoid being hit by the spiked Koopa shell that slides around the frozen playing field." Advice – "The more the Koopa shell moves, the faster it bounces, so watch out. The last player remaining wins the coins." Description – "Dodge the Spiny Shells! The last one standing wins!" On-screen – "Dodge Spiny Shell!" This page was last edited on June 3, 2018, at 23:30.